Place ingredients in bread machine according to manufacturer’s directions. Press start button. Or, dissolve yeast in warm water for 5 minutes. Combine flour, salt, xanthan gum, and brown sugar in a small bowl. Combine eggs, water with dissolved yeast, and oil in bread machine bucket. Add dry ingredients. Set to “light” cycle. Press start. This is the best machine bread yet! This is as close as I could come to “regular” bread. The blackstrap molasses gives the bread extra nutrient content but gives the bread a bit of a different flavor. My son likes it with either the brown sugar or the molasses. This bread freezes well. Peel and cut desired amount of apples into 1⁄2 –1-inch chunks. Place the chunks in the slow cooker and add about 1⁄2 cup water. Set the cooker on low and cook 4–6 hours, or until apples are soft. Mash with a potato masher to desired consistency. This recipe may be frozen. Refrigerate uneaten portions. To save time, make a large batch and freeze. To save money, use free or local apples. Slice potatoes in 1/4” strips. Toss sweet potatoes and oil in plastic bag or tightly sealed container. Mix and add remaining ingredients. Toss to coat. Put on four baking sheets or 9” x 13” pans. Bake at 400 degrees for 40 to 45 minutes or until tender. Stir every 15 minutes. For crispy fries, freeze after cooking and reheat in the oven for 20 to 25 minutes or until crisp. Makes 32 servings. Fries can be frozen. Make white sauce by melting the butter in a pan. Add cornstarch, salt, and then milk or coconut milk. Cook until thick. Pour potatoes in a casserole dish or pan. Pour the sauce over the potatoes and bake at 350 degrees until potatoes are done, about 1 hour. If you want to get done in a hurry, bring the potatoes to a boil or steam the potatoes for 15 minutes while making the white sauce. Then cook the scalloped potatoes for 20 to 30 minutes. Combine all ingredients. Bake, covered, in a 375-degree oven for 1 hour. This recipe can be frozen. *Kidney, black, pinto, or navy beans are good choices for this recipe. Heat refried beans in a small saucepan on medium heat. When warmed, spread beans evenly on tostadas. Top each tortilla with meat, sour cream, salsa, and cheese or cheese alternative. Preheat oven to 400 degrees. Place tostadas on baking sheet or stone. Bake 10–15 minutes, until cheese is melted or chicken is warmed. Serve immediately. Tostadas can be topped with shredded lettuce and fresh diced tomatoes. I make this when I need a meal in less than 10 minutes. Very quick and easy! Omit the cheese and sour cream for dairy-free tostadas. I vary the ingredients to what I have on hand. In a bowl, mash the beans and add salsa. Place 5 tortillas on ungreased baking sheets. Spread the bean mixture on the tortillas. Sprinkle with cheese, if desired, and top with the remaining tortillas. Bake at 350 degrees for 15 to 18 minutes or until crisp and heated through. Cut into wedges. Can be served with sour cream and salsa. Place vegetables in bottom of a crockpot. Salt and pepper the meat and place in the pot. Add water. Cover and cook 10–12 hours. Place unwrapped, frozen chicken in a crockpot. Cover and cook on low heat for 7 to 9 hours. Clean chicken off of the bones and serve the meat. The raw meat can be frozen for up to 1 year, and the cooked meat can be frozen for up to 3 months. Chop any leftover meat with a food processor or hand chopper and use in chicken salad or slice the meat and use in casseroles, chicken tortilla wraps, or any recipe calling for chicken. Make chicken broth from the leftover liquid and bones in the crock pot. large mixing bowl, lightly beat egg white. Add pecans; stir until coated. Sprinkle sugar mixture over pecans; mix well. Spread in a single layer on a baking sheet. Bake at 300 degrees for 20 minutes. Remove nuts while warm to cool on waxed paper. Yield: about 6 cups. *Peanuts can be substituted for the pecans. Cut firm, ripe bananas in half and insert a Popsicle stick halfway into each one. Spread peanut butter on at least one side of the banana. Place toppings in individual bowls or plates. Roll each banana in the toppings as desired. Eat immediately. This is a favorite snack for my children and a favorite snack to make at our Clover Kids 4-H club. roll for about 5 minutes, or until the mixture turns into ice cream. This makes one serving. You may use more than one sandwich bag inside the gallon-sized bag. This recipe works for most milk types. If you or your child does not like this ice cream, use the ice cream as a base for a smoothie. In a blender, throw this ice cream, a handful of fruit, , 1 banana, and about 1 cup of juice and blend until smooth. Enjoy! Follow the same instructions for 5 Minute Ice Cream, but substitute the allergy-free milk with 100% fruit juice, lemonade, or other liquid and, omit the sugar and vanilla. Container to hold popsicles such as popsicle holders purchased from the store or DixieTM cups. Add fruit juice to containers. Place sticks into mixture and freeze until solid. To serve, run container under cold water until the popsicle loosens and falls out. Enjoy! If you have young children, you may try 1/2 water and 1/2 juice to reduce the sugar content. Popsicle containers go on sale in midsummer and can be found at most department stores like Wal-Mart or Target. I found a wonderful set on sale at Williams-Sonoma that is made of metal and sturdier than most molds. Dixie cups or small drinking cups can be used, but you have to insert the stick after the popsicle is partially frozen. If you use Dixie cups, simply peel off the paper cup to serve. 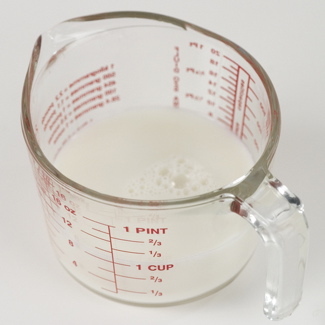 Boil milk, sugar, and butter for 1 minute. Mix other ingredients together; stir into boiling mixture quickly. When blended, drop on waxed paper by teaspoon. Let cool, then serve. *Quick-cooking oats are best. Be sure the oats are gluten-free if necessary. Combine ingredients. Roll into 1/2–1” balls. Place balls on a cookie sheet and press with a fork to flatten. Bake at 350 degrees for 8 to 10 minutes or until lightly brown. This cookie can be pressed and baked into a large crust for fruit pizzas or tarts. Cream together the coconut oil and sugar. Add vanilla and almond milk. In a separate bowl, combine rice flour, coconut flour, tapioca starch, baking powder, and baking soda. Add dry ingredients to wet ingredients and mix until just blended. Roll into 1” balls and flatten slightly on a greased cookie sheet. Bake 10–12 minutes at 350 degrees. Remove from the pan gently while still warm. Let the cookies cool. This recipe is based on a recipe found on the back of Bob’s Red Mill coconut flour package. Bob’s Red Mill is an excellent source of gluten-free flours and baking products. Grease a donut pan with coconut oil and preheat oven to 350 degrees. Combine the first 8 ingredients in a bowl. In a medium pot, add milk and coconut oil and warm over low heat until the coconut oil melts. Do not allow this to boil. Mix gently with a wooden spoon while warming. Once the oil is melted, remove from heat and add in the sugar. Stir together until sugar is dissolved completely. Add applesauce and vanilla extract and stir to combine. Pour the liquid mixture into the dry ingredients and mix gently until combined together well. (An emersion blender can be used to make the batter smooth if clumps form in the batter.) Add coconut flakes and mix with a wooden spoon. Pour into a greased donut pan and fill about half way. Bake for 15 minutes at 350 degrees. Allow to cool for 15 to 30 minutes before removing from the pan. Glaze: and 1⁄2 cup powdered sugar into a small bowl and add 1-2 T. of hot water. Mix well to combine. Coat the donuts thinly with the glaze. The donuts can be sprinkled with coconut flakes, if desired. Make extra doughnuts and freeze them. They can be thawed and eaten or heated and served warm. If you don’t have a donut pan, you can use a cupcake pan to bake them in. They also can be made with an electric donut maker. This recipe is based from the recipe book So Delightful by So Delicious® Dairy Free. So Delicious® is my favorite brand as a milk alternative. The vanilla flavored milk is wonderful for baked goods and smoothies. 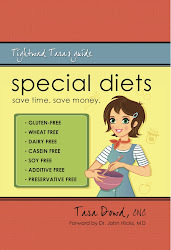 Visit their website at http://www.sodeliciousdairyfree.com.